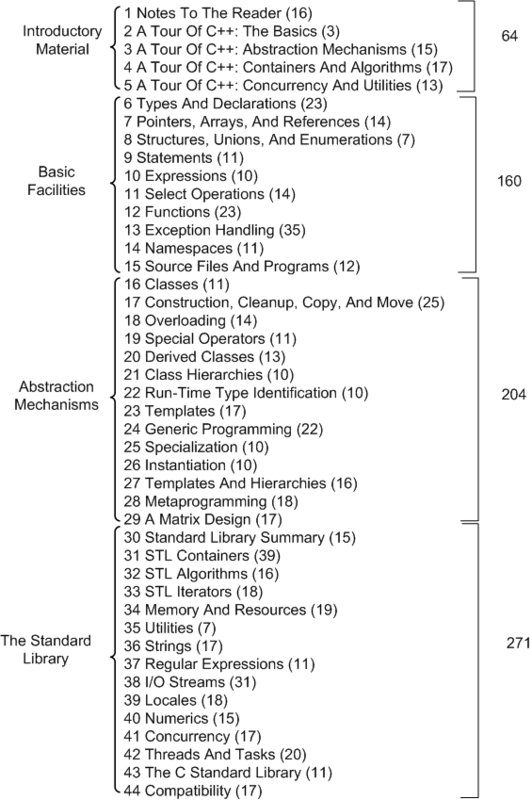 The fourth edition of “The C++ Programming Language” weighs in at 1346 pages and 44 chapters allocated over four partitions. The end of each chapter provides a list of advisory items – yielding a grand total of 699 nuggets of general programming and C++ specific wisdom for the reader to ponder. The figure below shows a breakdown of the behemoth book’s table of contents. The number of advisories provided in each chapter and each partition are shown on the right side. 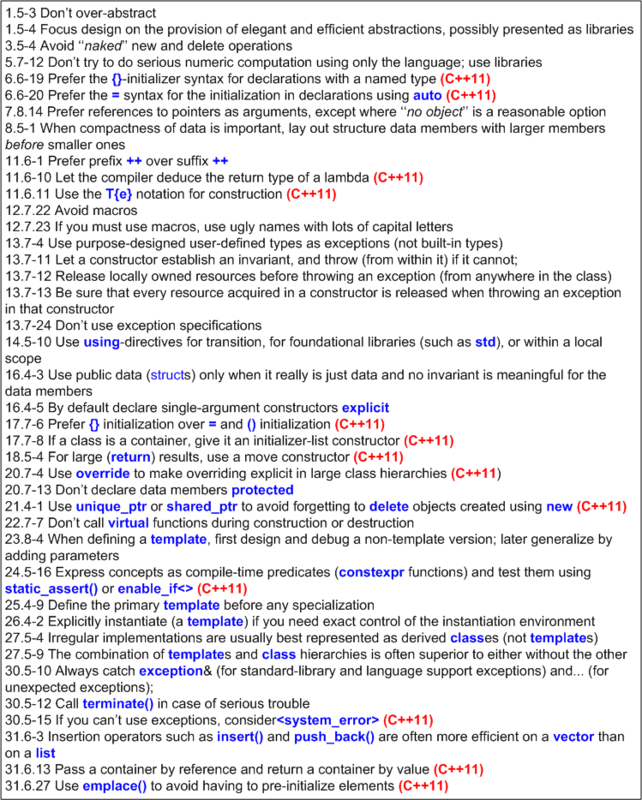 As a temporary excursion from reading and studying and writing exploratory snippets of C++11 code, I went through all 699 items and plucked out a subset of the tidbits I found most useful. 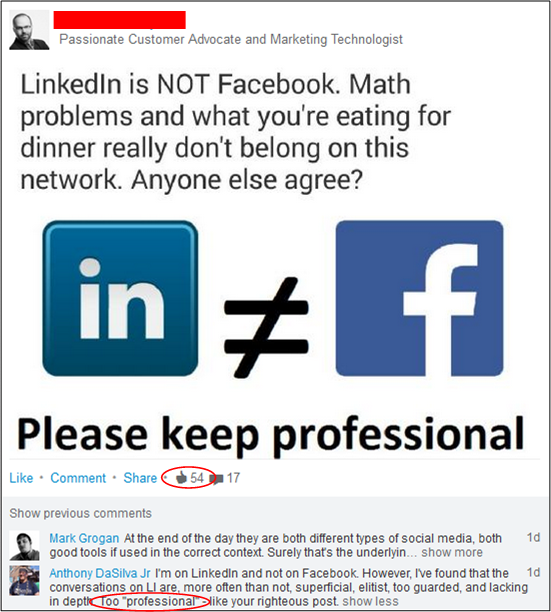 Of course, your personal list would no doubt turn out differently. D’oh! Wanna guess at how much time is needed for all to become clear? Maybe Malcolm Gladwell‘s famous “10,000 hours” isn’t enough? But that’s why I love C++. It provides an endlessly rich and deep opportunity for learning. Now granted, BD00 may come across as being a poser to some/many, but he actually tries to fend off the strong, innate desire to impress others with his self-proclaimed “expertise“. Of course, as the content of this blog confirms, he often fails miserably. How about you? How often do you find yourself posing for the camera? Ok dear reader, it’s quiz time! How does an enduring album come into the world? How does a revered painting emerge into being? How does a beloved novel spring forth? 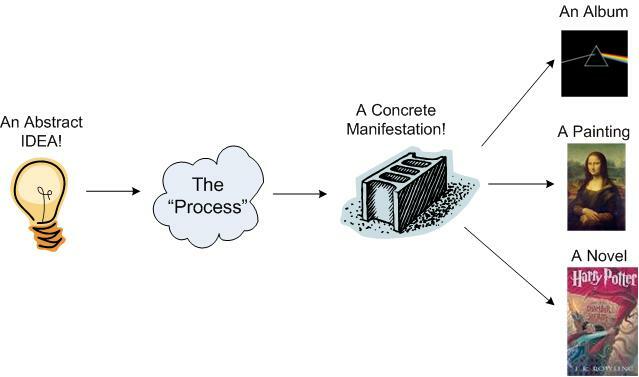 Please describe the “Process” in your own words…. BD00 has been following the development of Ivar Jacobson et al’s SEMAT (Software Engineering Method And Theory) work for a while now. He hasn’t decided whether it’s a revolutionary way of thinking about software development or a bunch of pseudo-academic malarkey designed to add funds to the pecuniary coffers of its creators (like the late Watts Humphrey’s, SEI-backed, PSP/TSP?). To give you (and BD00!) an introductory understanding of SEMAT basics, he’s decided to write about it in this post. The description that follows is an extracted interpretation of SEMAT from Scott Ambler‘s interview of Ivar: “The Essence of Software Engineering: An Interview with Ivar Jacobson”. As the figure below shows, the “kernel” is the key concept upon which SEMAT is founded (note that all the boasts, uh, BD00 means, sentences, in the graphic are from Ivar himself). 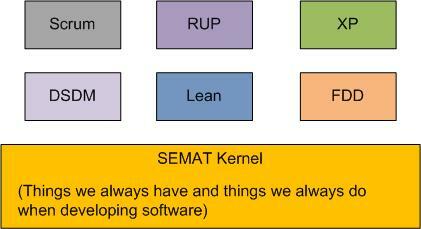 In its current incarnation, the SEMAT kernel is comprised of seven, fundamental, widely agreed-on “alphas“. 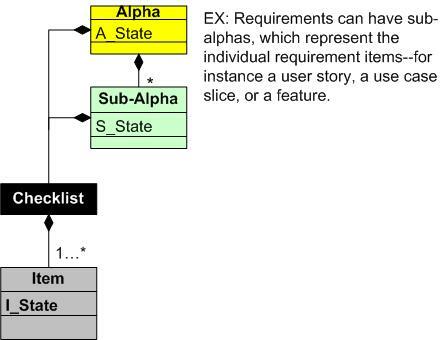 Each alpha has a measurable “state” (determined by checklist) at any time during a development endeavor. 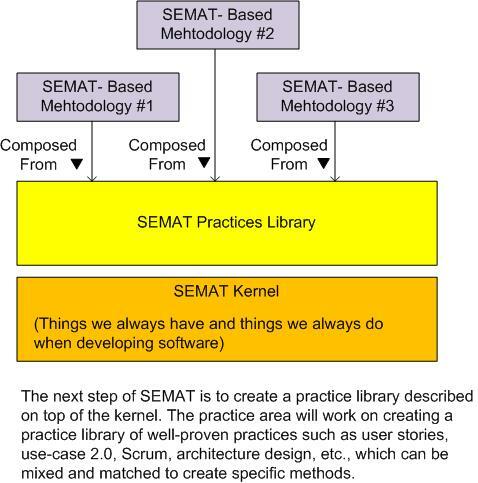 As the diagram below attempts to illustrate, the SEMAT kernel and its seven alphas were derived from the common methods available within many existing methodologies (only a few representative methods are shown). 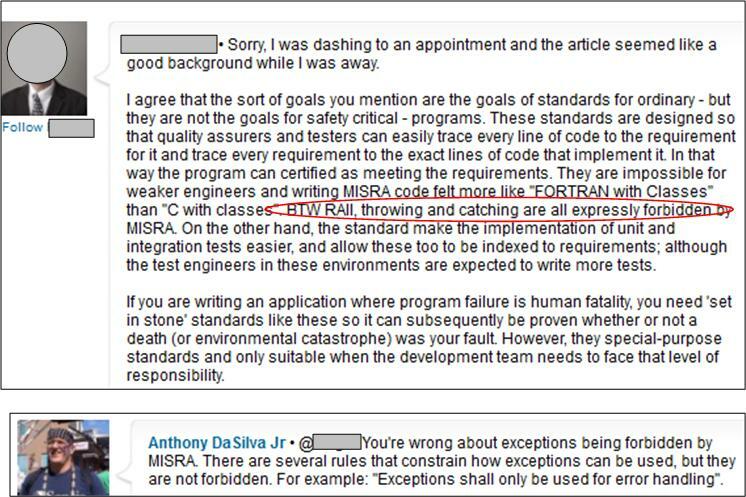 In the eyes of a SEMATian, the vision for the future of software development is that customized methods will be derived from the standardized (via the OMG!) kernel’s alphas, sub-alphas, and a library of modular “practices“. Everyone will evolve to speak the SEMAT lingo and everything will be peachy keen: we’ll get more high quality software developed on time and under budget. But wait! 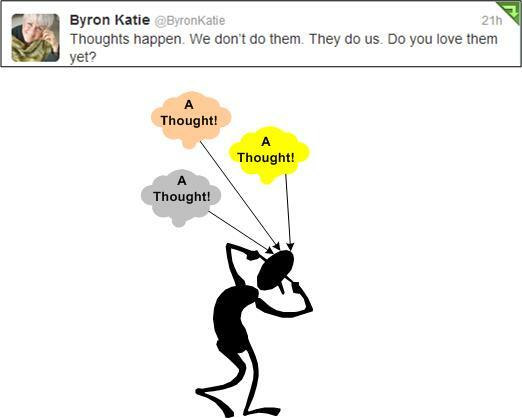 BD00 has been wrong so many times before that he can’t remember the last time he was right. So, do your own research, form an opinion, and please report it back here. What do you think the future holds for SEMAT?